Low carb, naturally gluten-free, and meatless Baked Caprese Zucchini Roll Ups that make dinner a delicious yet easy task. Are you a fan of Caprese salad? How about zucchini? I love both, and since I have been on a low carb diet, I have been looking for better alternatives for rice, pastas, and other carbs. Grab a medium baking dish. Spread a bit of tomato sauce, arrange zucchini roll ups filled with a cheese mixture, tomato sauce, and basil, and then top with more cheese. Cover with foil and bake at 400º F for about 20 minutes or so. Meanwhile, browse the internet or read your favorite book/magazine. That’s it! Dinner will be ready in the blink of an eye. I know… This casserole has everything, including the taste of life made easier for busy moms/full-time workers like us. Our Caprese Zucchini Roll Ups don’t require any special skill from the cook. It’s also a complete meal all by itself… and leaves your kitchen free from a load of dishes and kitchen utensils. It may not have “one-pot” or “one-skillet” in its name, but it is definitely part of that same family. It also makes the list of recipes that are naturally gluten-free, as I mentioned earlier. If you would like to add a GF starch, white rice would be a good option to serve along with it. 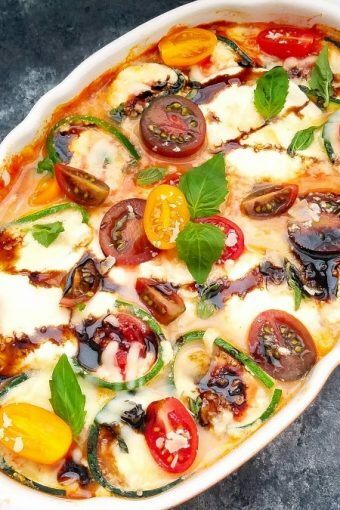 If you are taking this dish to a potluck, garnish its top beautifully with grape tomatoes, basil leaves, and a drizzle of balsamic vinegar. As you can see, simplicity here is a real plus! I will leave you now with the formula for one hero of a dish that you can enjoy without stretching your waistline, and which is easy enough to prepare that you can get some much-deserved rest. For more low carb weeknight meals, try our delicious Cauliflower Curry Soup. Well, take care and stay healthy! Preheat oven to 400° F. Spread marinara sauce onto a bottom of a medium baking dish and set aside. Cut-off and discard zucchini ends and then slice each zucchini 1/8" thick lengthwise. In a medium bowl, combine ricotta, 1 1/4 cups mozzarella, 3/4 cup Parmesan, and salt. Taste and adjust salt if desired. Stir in the egg well. If you would like to, add a pinch of pepper. 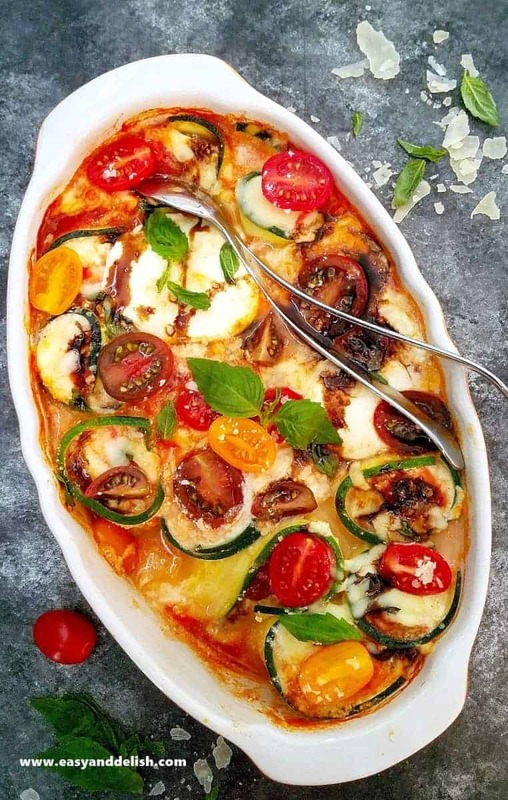 On each slice of zucchini, spoon a thin layer of sauce, top with a thicker layer of the cheese mixture, and sprinkle a little bit of chopped basil. Roll up and place in the prepared baking dish. Sprinkle with remaining 1 1/4 cups mozzarella and then 1/4 cup Parmesan. 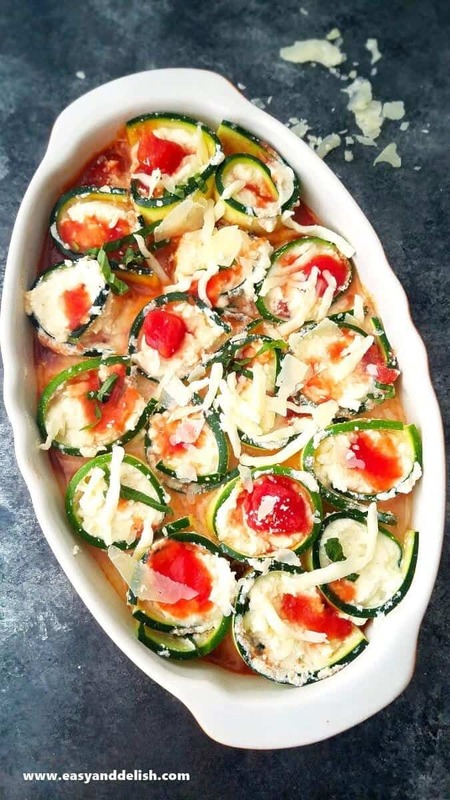 Cover with foil and bake for about 18-20 minutes or until zucchini is tender and cheese is melted. If desired, garnish top with halved grape tomatoes, basil leaves, and a drizzle of balsamic vinegar. This casserole can be served by itself or with a side of white rice. Enjoy! 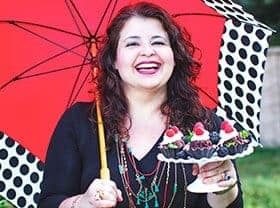 It looks beautiful, Denise and sounds delicious! I would love to try it. Love how quick and easy this meatless recipe comes together! So much flavor too! 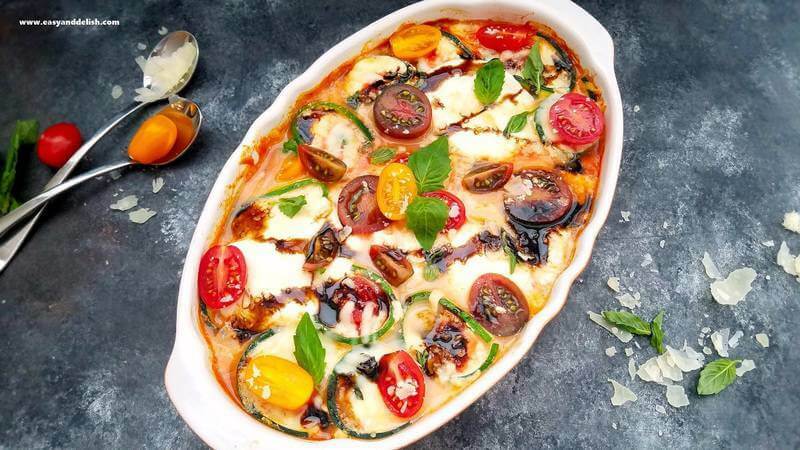 Mmm, loved a baked dish like this that’s loaded with flavor! This looks terrific — and perfect for the cold weather we’re having. Thanks! I love the flavours in here! It looks so amazing Denise. I would take this over pasta any day. Your photo is beautiful! This recipe sounds delicious, pumpkin roll is very healthy food! I’m amazed at your creativity. Your photos are so vivid! You got a fan Dennise! Your photos are so vivid! I love this recipe. This one it’s on my bucket list. Those zucchini rolls look to die for! I can’t wait to try them. What a wonderful idea. Caprese salad has always been one of my favorites, it looks so pretty.